The park did a fantastic job of theming the station, The massive clown head, Joker trinkets, and ground paintings make the ride entrance a destination within itself! Discovery Kingdom has continued their streak of highly theming their new attractions, which is always applauded. The station itself is pretty familiar, minus a fresh coat of red fun house paint! The cars themselves are snug for riders, but provide taut and welcoming lumbar support. This is appreciated during the ride's countless twists and turns! Onto the ride itself. The coaster does a great job of incorporating thrilling elements from the past ROAR wooden coaster with the signature experience a RMC Wood Steel Hybrid coaster delivers. 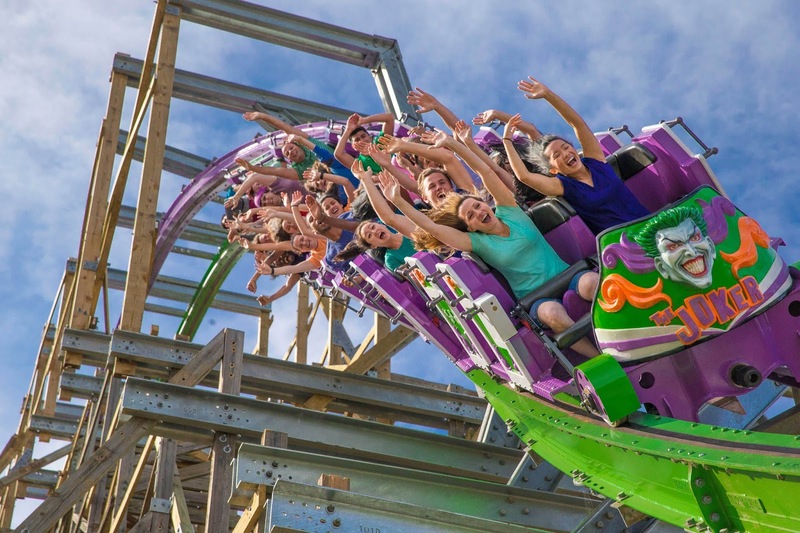 The first drop, for example, will feel familiar to past ROAR riders, yet brand new in its own way. The pacing of the ride is superb, and rids the attraction of the awkward pauses and lapses from its previous incarnation. The ride does not feel super fast, but the speed is high enough for the twisting elements to be thrilling and enjoyable. The coaster feels very cohesive among its different elements, but this also means that their is no "special" or "absolute best" part. If I had to pick a highlight, it would be the final barrel roll towards the end of the ride. The inversion takes you by surprise due to its location on the ride. The train enters this inversion much slower than the other two, and the lowered speed brings different and interesting g forces to this seemingly familiar element. As a whole, the coaster is a solid attraction. 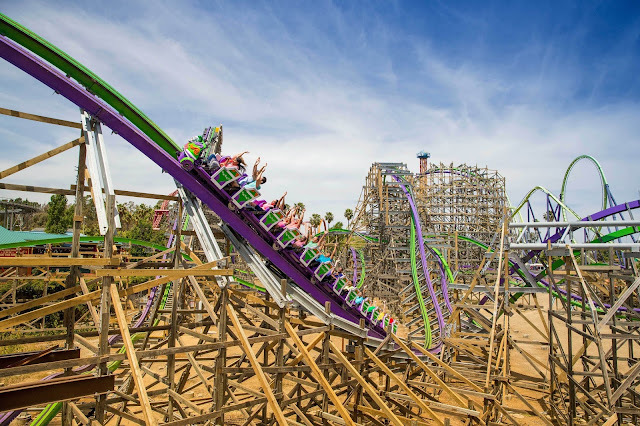 It stands as a somewhat compact yet complete package for all the signature airtime and thrills Rocky Mountain Constriction coasters deliver. It may be too early to call, but I believe The Joker will become Discovery Kingdom's premiere coaster. Make sure to experience this unique attraction as soon as possible! The ride gift shop is still under construction, but should be opening soon! Additionally, the neighboring Tsunami Soaker attraction has been renamed to "The Penguin" and now carries a DC Comics theme. It looks like Six Flags Discovery Kingdom finally has a mini DC Comics land of its own! 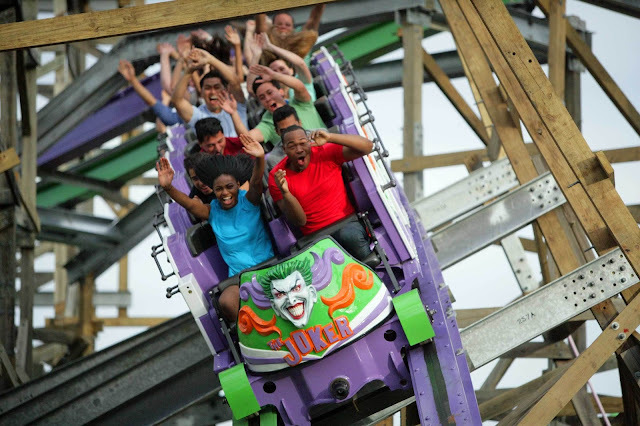 The Joker delivers on every front, and is an absolute "Can't Miss" for any Northern California thrill seekers! That's all for now from ThemeParkOverload.net. Special Thanks to Nancy Chan and Six Flags Discovery Kingdom for their continued support! Make sure to "Like" our Facebook Page for Breaking News and Live In-Park Updates! www.Facebook.com/ThemeParkOverload My name's Nicholous, and Thanks for Reading!